The TM-Town Terminology Marketplace has just been updated. In addition to some design changes the marketplace now also has a brand new term search feature. Search a term and you'll be able to see if there are any glossaries on the marketplace that include your term. In addition to searching for a term you can also filter your search by language pair or seller. 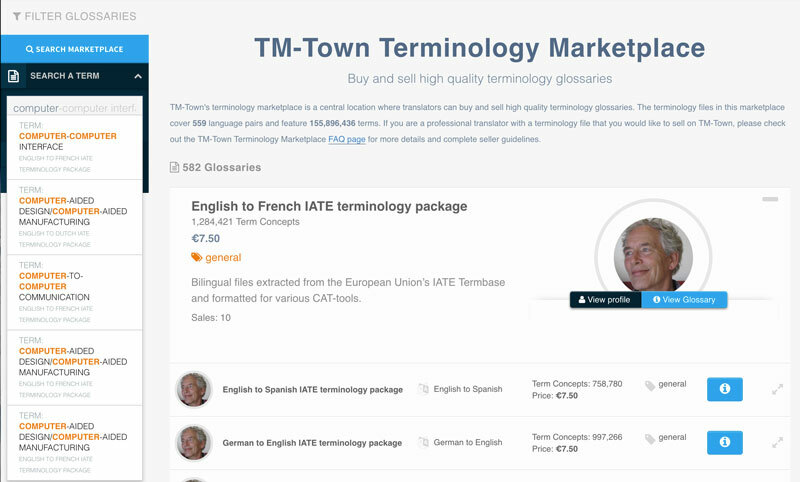 The TM-Town Terminology Marketplace has now had more than 100 sales. Give it a try - search a term and if you find a glossary that would be useful for you be sure to support your fellow translators by making a purchase. If you would like to sell a glossary on the marketplace check out our FAQs and seller guidelines which includes a video showing you how to get started. Netherlands Posted over 3 years ago. Thanks, Kevin, for creating this lightning fast search function. It certainly will help translators in deciding whether buying my packages could be of interest for them. Makes for a great start of 2016! Thanks Henk! Have a Happy New Year.